New digital street units providing ultrafast speeds of up to one gigabit per second (1Gbps) to Londoners - the UK’s fastest free public Wi-Fi service available – as well as free phone calls and a range of new free digital services, have been switched on today. 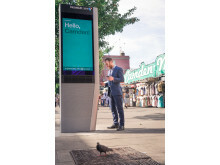 The first of these new units, called InLinks, which will replace some of BT’s existing payphones in the capital, have appeared on Camden High Street in London, thanks to a new partnership between BT, Intersection - the company behind LinkNYC, and Primesight - a leading UK outdoor advertising company. 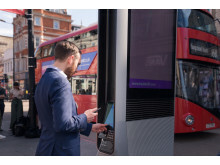 The new InLinkUK from BT service will start to be rolled out to other high streets in London and major cities throughout the country this year. Hundreds of users within range of an InLink will be able to access free ultrafast Wi-Fi on the move, with speeds of up to 1Gbps - the fastest free public Wi-Fi service available. Other services available from the InLinks will include free UK landline and mobile phone calls, mobile device charging, access to maps, directions and local services, and a new BT Phone Book app enabling users to search for businesses by type and name, as well as people by name. InLinks’ digital displays will feature real-time information, such as tube service updates, weather forecasts, and community messaging. All InLink services are free of charge to users and taxpayers as the project is funded by advertising revenue generated by the InLinks’ digital displays. 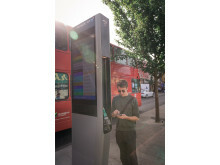 The InLink design takes up less space on the street than a traditional payphone and will be installed in smaller numbers than the existing payphones they replace, freeing up space on pavements. 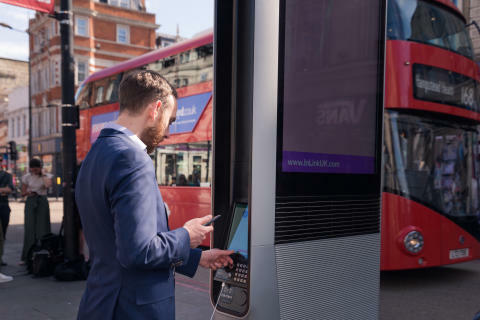 London is the second city to benefit from the innovative units, following the launch of LinkNYC last year. Since the first units were switched on inNew York City in January 2016, over 1.8 million users have registered to use the Wi-Fi service. Gerry McQuade, CEO, BT Wholesale & Ventures, said: “This is the phone box of the future. 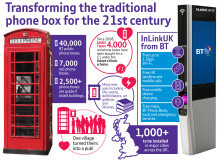 InLinkUK from BT brings the payphone up-to-date and gives people the services they need and use every day in the 21st century - and the bonus is it’s all for free. “But as well as the free services - ultrafast Wi-Fi, phone calls, rapid mobile charging and local information – councils and community organisations will be able to use the screens to provide up-to-the minute news and information to local residents. Matt Bird, general manager, InLinkUK, said:“InLinks introduce the technology we need to create a better urban environment.InLinks in the future will feature sensors to capture real-time environmental data, such as pollution and traffic conditions, never seen before in the UK at such a micro level. Naren Patel, CEO, Primesight, said: “As London continues to develop as a smart city, the launch of the InLinks will provide a real value exchange between consumers and brands. “Consumers will see relevant content from brands on the screens and use the free services provided, and in turn brands will benefit from being associated with a product that will provide real benefits to the people in the communities. It’s a fast, smart, ad-funded product that is set to benefit consumers and advertisers alike. Ari Buchalter, CEO, Intersection, said: “As a global hub for business, technology, and culture, London is the perfect environment for digital innovation. “As we’ve seen in New York City with LinkNYC, providing free high-speed Wi-Fi access, real-time information, engaging content, and digital services on city streets can valuably enrich people’s experiences of a city on their daily journeys between home, work, shopping, and entertainment. Previously known as LinkUK, the joint venture team behind the ground breaking InLink product has chosen to update its name to InLinkUK to create a distinctive brand in the UK market.Their products will be known as InLinks in the UK, Links in NYC. There is no difference between Links in NYC and InLinks in the UK - both provide communities with free gigabit Wi-Fi, phone calls, device charging, maps and access to local services. Individual download speeds are dependent on a number of factors including: the capability of a user’s mobile device, distance from the Link, environmental conditions and the number of users connected at a given time. 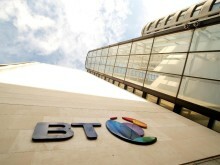 BT already operates the biggest network in the UK, giving customers unlimited access to the most extensive Wi-Fi coverage with more than five million hotspots. For images, see The BT Media Image libraryandTelefocus - historical images from BT Archives. Intersection is at the forefront of the smart cities revolution, improving the experience of public places through technology that provides connectivity, information, and engaging content and experiences. With award-winning products like LinkNYC, the largest and fastest free public Wi-Fi network in the world, Intersection connects the digital and physical worlds, enhancing people’s journeys through their cities and offering brands the opportunity to drive more relevant and engaging advertising, rooted in real-world location and physical context. Intersection partners with cities, transit systems, airports, and real estate developments around the globe, as well as advertisers seeking to reach audiences on a global, national, or local scale. Intersection is backed by Alphabet through its urban technology company Sidewalk Labs. Learn more at www.intersection.com.